Help! My children are becoming couch potatoes! Home » Dad » Help! My children are becoming couch potatoes! Everyone loves watching television. Whether it involves sitting down to catch a quirky sitcom after dinner or indulging in a weekend marathon of a favorite premium cable drama, zoning out in front of the TV can be a great way to relieve stress after a hectic day. However, some people have difficulty pulling themselves away from the screen for more than a few hours at a time – leading to a television obsession that can harm personal relationships, work ethic and a healthy lifestyle. This fixation can be especially detrimental for young children who are still developing intellectually and emotionally. While it may be nearly impossible to keep your little ones away from the television indefinitely, as a father, you want to make sure they're receiving a healthy balance of other stimulating activities. And let's face it – these days, it's not just television that can fuse your children to the couch. Video games, tablet computers, laptops and smartphones can all become electronic distractions that take away from beneficial activities like outside playtime, reading, homework and athletics. If it's getting harder to pry your kids away from the television screen, you may need to take more drastic actions. Implementing a daily or weekly time limit – whatever time you feel appropriate – on the amount of TV they can watch will help get them up and moving. For video games, keeping their controllers locked away in a safe location can help you regulate how often your children play. 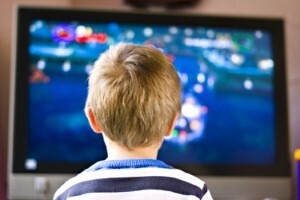 However, simply taking away the television or video games may not be enough to refocus your kid's attention. You need to encourage (or even force) them to get out of the house and try new things. Enrolling your young ones in summer camp, after school activities or a local athletics programs can help them foster an active lifestyle while exposing them to new friends and experiences. Make sure you remain involved in their post-television habits as well to ensure their continued success.